“The Filipinos have suffered enough. The LP made a mockery on our democracy.” These are the powerful phrases from former Presidential Assistant for Economic Affairs. For Alejandrino, anyone can spot how Franklin Drilon got more votes than PRRD, if he is that powerful, and then LP must have endorsed him to be the President of the Philippines. Alejandrino also said that our questions will be answered once the recount for the vice presidency commences. Alejandrino also recalled that before he wrote the LP’s plan to harm the reputation of Duterte and let him be replaced by Leni Robredo who, according to Alejandrino, was easy to manipulate and influence. He also said that discrediting starts as soon as Leila de lima investigates on EJK to gain the attention of international media. Then the citizenry became the audience of the staged and perjured lies by de lima and coup planner Trillanes. He also advised the opposition to support the administration in solving the problems of this country. “My advice fell on deaf ears. Druglord money and political self-interest prevailed. As the comedy went on and more destabilization ensued, I told myself the Opposition would cut its own neck. All they needed was more rope to hang themselves.”, said Alejandrino. 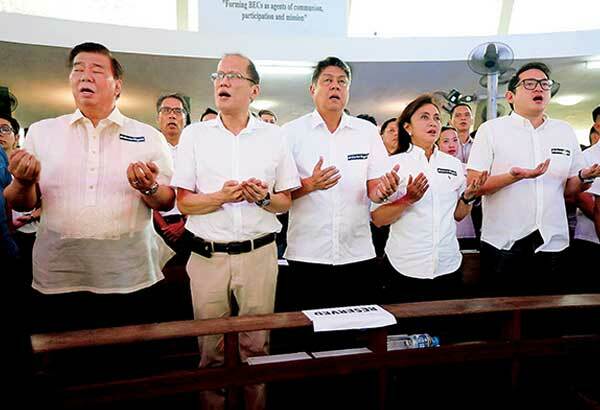 Alejandrino also stated all the supporters and believers LP, which supported the parties’ finances. He also said that these benefactors of LP want nothing but to oust Duterte from Presidency. But these groups have not foreseen the victory of Donald Trump. And Trump supports Duterte on his war on drugs. Alejandrino also said that no one expected the rebellion in Marawi City and lead the president to declare Martial Law in Mindanao. Then the opposition, thanks but no thanks to Hontiveros and Lagman, cause difficulties on the part of the president by repeatitively stating that there’s no need for Martial Law . And the trolls of the opposition started to fabricate rumors on his health and the military’s allegiance to the President was tainted. The president would follow SC’s ruling on Martial law, but the President stated that if and only if another terror attack happened, he would be unhesitant to declare Martial Law again, a Marcos Style Martial Law, sending the LP that he had enough of their nonsense. The opposition made it to their own selves and that justice will hunt them for they are the roots of these terrible situations that happened. If only the opposition listened to Alejandrino, they would not be swallowing the poison that they have invented. The Filipinos have suffered enough. The LP made a mockery of our democracy. After the May 9 elections, I had said there was massive cheating. It doesn't take a genius to figure out how Frank Drilon obtained 18 million votes while Rodrigo Duterte only got 16.6 million votes. If he was the most popular politician in the country, I had said, why didn't the LP field him as its presidential candidate instead of Mar Roxas who only obtained some 10 million votes? When the votes are properly recounted in three areas, as Bongbong Marcos asked, we will begin to have the answers. After the May elections, I had written about the LP plan to discredit Duterte and replace him with Leni Robredo who was easy to manipulate and influence. I had said it would begin with Leila de Lima's committee hearings in the Senate to show that Duterte was behind the Davao Death Squads and EJKs to catch the attention of the foreign media. That is why I called Koko Pimentel a damn fool for handing her the chairmanship of the committee. True enough, the farce began. The public was treated to the spectacle of perjured witnesses coaxed by Leila de Lima and Antonio Trillanes whose chief claim to fame was as a coup plotter. I had written that the May elections were over and advised the Opposition to cooperate with Duterte in solving the problems of the nation. My advice fell on deaf ears. Druglord money and political self-interest prevailed. As the comedy went on and more destabilization ensued, I told myself the Opposition would cut its own neck. All they needed was more rope to hang themselves. A patient Duterte gave them more rope. The Opposition kept making one mistake after another till the people realized they were being made a fool of. Thanks to the social media, concerned netizens took the offensive by informing the public of what was afoot. The Opposition conspiracy got bigger and bigger. In addition to Loida Lewis who had been financing the LP, other foreign liberals like George Soros' Open Society Foundation and Guy Maurice Verhofstadt, head of the Alliance of Liberals and Democrats in the European Parliament, joined the fray. Both Soros and Verhofstadt advocated the legalization and decriminalization of drug use and wanted an end to Duterte's war on illegal drugs. Chito Gascon's CHR facilitated the coming of Carl Hart and Agnes Callamard, a UN rapporteur, both associated with Soros' Open Society Foundation, to Manila to debunk Duterte's claim that illegal drugs were harmful. They convinced Robredo to favor legalization and decriminalization. When Duterte stood his ground, Verhofstadt, whose EU aid contained conditionalities which Duterte rejected, threatened to bypass Duterte and give it directly to the people. In reality, a large portion of the aid was to go to the LP and CHR and their support network of NGOs. Their plan would have worked had Hillary Clinton, who received a large contribution from Loida Lewis, won the presidency. Duterte would have been deposed and Robredo put in his place. They never expected Donald Trump to win. After Trump won, he called Duterte to congratulate him on his war on drugs. So the liberals abroad and here suffered a major setback. The LP continued to plot against Duterte and destabilize the country. That is why I had suggested the people give him rev powers the same way Cory was given them but failed to use because of her inexperience to introduce reforms with the stroke of a pen as I had urged her to do. But some members of Duterte's Cabinet tied to the PDP-Laban, the president's party, torpedoed the idea. It was to be expected. A revolutionary government which would abrogate the Cory Constitution would mean closing down institutions like Congress. Again, party interests took precedence over the national interest. How could Duterte possibly succeed in bringing meaningful change without extraordinary powers given the enormous problems he faced? Once more traditional politics reared its ugly head to ensure the status quo would remain. What nobody anticipated was the rise of terrorism and the taking of Marawi by the Mautes affiliated to ISIS. Had it been anticipated, not everybody would have gone to Russia. Only DBM Sec. Ben Diokno was left behind. When Marawi happened - and here I have to credit Antonio Trillanes for predicting if he was quoted correctly that something would blow in May - the president was left with no option but to declare martial law in Mindanao. He cut his visit to Russia short to take charge. While our brave soldiers were dying in Marawi fighting to retake it from Mautes and foreign fighters brandishing ISIS flags, the Opposition again was determined to complicate the life of the president, the police and military by claiming there was no need for martial law because there was no rebellion or invasion. It defended its claim in petitions to the Supreme Court arguing legal trivialities such as definitions and some members of the Court appeared to agree with the arguments of Risa Hontiveros and Edcel Lagman. Again, another farce by the Opposition to put roadblocks along Duterte's way by using the Constitution. Their supporters on social media started inventing stories like the president being in a coma and the US was planning a coup against him. I had warned the Opposition not to tax Duterte's patience. It was coming to an end. So was the patience of many netizens who kept pressing the president to assume extraordinary powers to put a stop to all the nonsense so that we could all go back to our daily lives and focus on national development. The president responded. He would comply with a SC decision even if it was negative. He would pull out the military and police from Marawi. But he warned that if there is another incident of bombing or terrorism or destabilization he would call out the reserve forces and establish a Marcos-style martial law without consulting anyone. It was a clear signal that he had enough of the nonsense. A day of reckoning was coming. The Opposition only has itself to blame. When its members look back on what I had written when they are planting camote under the hot sun or are being treated in a mental asylum, I imagine they will lament their own stupidities. As they say, regrets come too late. As for the hardened cases, the plunderers, the druglords, the terrorists, they won't have time to regret when they are hanged from the scaffold after quick trials. They brought terror and suffering to the people. Now they have to pay for what they have done. It's called Justice.